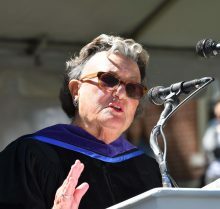 Thank you, President Hanno, Wheaton trustees and faculty, the Class of 1967 and the Class of 2017, for this extraordinary honor, which 50 years ago none of us could have imagined. Like today’s graduating class, I wanted the speeches to be over so I could go out into the world, which Wheaton helped prepare me for. The ’60s were transformative. On campus, my goal as social chairman was to create a two-party system—one Friday night, one Saturday night. The best thing about the good old days is I wasn’t good and I wasn’t old. Meanwhile, though, off campus, the Vietnam War, the assassination of President Kennedy and other leaders, the civil rights, women’s rights, gay rights, student rights and riots changed everything. The professors and administrators of our college taught both the importance of asking articulate questions and how to listen to the answers, which led to my early career in television journalism. Covering Watergate was frustrating. But I learned to direct my anger toward problems, not people—to focus energy on answers, not excuses. So I switched to try to make changes in government and later created organizations to help women both succeed and make a difference in their organizations in the world and for the world. Diverse perspectives are needed the most at times of uncertainty. Decision-making groups comprised of both men and women have constantly shown to outperform groups comprised only of men. The world needs women to play a far stronger role, leaders who are diverse, multigenerational, multi-regional, multinational and multicultural, with energy, intelligence and integrity. … We need performance, not promises. Rhetoric cannot become a substitute, instead of a prelude, to action. I said, “We can’t do that. The stock exchange is 11 white men. When you elect women on the board of the stock exchange, we’ll come ring the bell.” They called back a day later and said, “We can’t get it done in the next month, but if we promise you that by the time that you ring that bell, we will have a woman nominated, will you ring the bell?” And we did and now there is a woman on the board of the Chilean stock exchange. … Be open to whatever opportunities that you can take. You never know what path to follow or what the hidden lessons will be. When something is important enough, you should do it, even if the odds aren’t in your favor. To make your way to the corner office, or wherever you want to be a success, build trust, deep relationships, and create your own networks that will help you along the way. You need to control your own destiny or someone else will. The more diverse our experiences and knowledge, the more connections our brains and hearts can make. The greatest use of life is expended for something that’s going to outlast it. There is only one way around criticism; do nothing, say nothing, be nothing. Life is not about waiting for the storms to pass but about learning how to dance in the rain. The secret of change is to focus your energy not on the ability of the old, but on the ability of the new. As you progress, your assumptions are your windows to the world. Scrub them off every once in a while. Be able to sort of see and let the light in. On matters of style, swim with the current. But on matters of principle, stand like a rock. Every exit is an entrance someplace else.